This weekend went way too quickly, didn't it? Here we are, Monday. Again. It's still summer and it's still warm so I thought we would look at a dress trend that has been quite hot this summer but it keeps you quite cool. The off the shoulder trend is boho chic but for me it can come off a bit swim cover up. What makes this style work for me a bold print. It elevates this trend for day or night. So very Mad Men and I love the pink against the blue. Dress this up with heels and dress it down for daytime with gladiator sandals or espadrilles. A beautiful tangerine color is going to go perfectly with a long delicate necklace for daytime or statement earrings and an updo for night. Garden party, rooftop sangria, casual wedding? 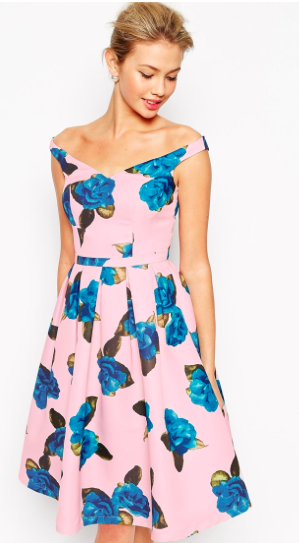 Take your pink with this dress. While some ladies can pull of the the off the shoulder look, I feel frumpy in it, except for these beauties. These options pull together a well cut dress, color, and pattern all in one.